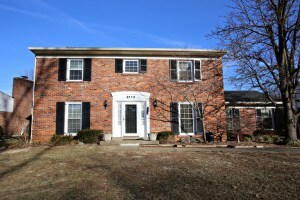 9113 Tiverton Way Louisville KY 40242 is a lovely 4 bedroom brick home in the Westwood subdivision. The front entrance opens to a two story foyer accented by wainscotting, neutral walls, and hardwood flooring. The Living Room showcases crown molding and leads into the cozy Family Room with built in book shelves & handsome brick fireplace. 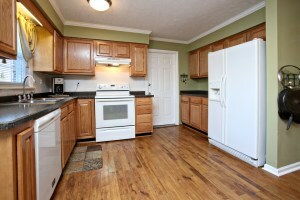 The Eat In Kitchen is beautiful with hardwood flooring and spacious dining area. 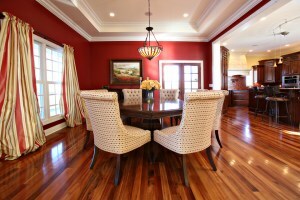 There is a Formal Dining Room that is currently used as a private office. A half bath finishes the first floor. The Master Bedroom displays crown molding, hardwood flooring, & private Master Bath. Three secondary bedrooms are good sized and positioned conveniently to a Full Bath. The partially finished Basement includes a large Family Room, Recreation Room, Laundry Room, & additional room that is currently used as another Bedroom. 9113 Tiverton Way Louisville KY 40242 also includes a 2 car rear entry garage and a wonderful backyard complete with patio, grassy yard, and storage shed. View the video below to see additional photos or visit the above property link for full property details. Call 502-371-1173 to set up a private showing or to speak with one of our agents about the latest in Louisville Real Estate! At Home In Louisville Real Estate Group will be hosting an Open House this Sunday Feb 2nd at 328 Hillcreek Rd in Shepherdsville! Come out and view this beautiful five bedroom home with 3 full and 1 half bathrooms! Tastefully designed and spacious interior! There is an expansive yard and a 3 car garage as well as a 2 stall barn! Call 502-371-1173 for more information about this property or visit Open Houses in Louisville KY to see all open houses in the Louisville area this weekend! 9104 Hassy Way Louisville KY 40299 is an exquisite custom built ranch home sitting on a picturesque wooded lot in Hazelwood Estate! 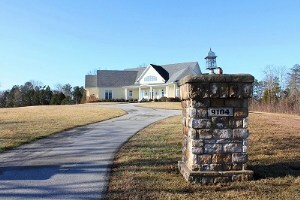 The property offers just under five acres of lovely rolling land and features incredible custom finishes throughout. A welcoming circular drive and stunning covered porch open to a dramatic Foyer with 20' ceilings and sparkling hardwood flooring. The Great Room also showcases hardwood flooring as well as built in book shelves, a gas fireplace with marble surround, transom windows, and a wet bar with granite counter. The Formal Dining Room is spacious with hardwood flooring, recessed lighting, and tray ceiling and opens to the beautiful Kitchen. Both the Dining Room and the Kitchen access the screened-in back porch which displays a stone wood burning fireplace with elevated hearth. 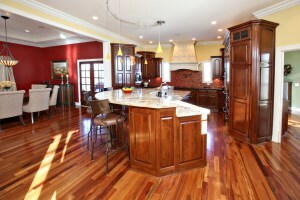 The gourmet Kitchen showcases granite counters, breakfast island, custom cabinetry, and top of the line appliances. There is a GE stove top with five burner glass top, a GE Monogram warming oven, GE Monogram convection/conventional and Advantium oven, and GE Monogram dishwasher. New owners will even enjoy a built in Sub Zero refrigerator with custom cabinetry facade and two drawer freezer as well as a built in Miele coffee maker with plumbing that can make espresso, tea, cappuccino, and coffee at the push of a button! The Master Living Quarters offer amazing privacy with a large bedroom with natural light, huge walk in closet, private Study, and Luxurious Master Bath. The Master Study includes its own gas fireplace and access to a private back porch. The Master Bath showcases double sinks, a handsome columned Jacuzzi tub, marble floor, and a walk-in marble shower (approximately 7' by 8') with a built in bench. The two first floor secondary bedrooms share a Jack and Jill Bath. Each bedroom has its own individual vanity and commode wtih a shared Jacuzzi tub in between. A pleasant half bath and Laundry Room wtih utility sink complete the first floor. 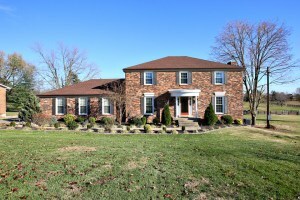 9104 Hassy Way Louisville KY 40299 has a finished basement with nine foot ceilings throughout. 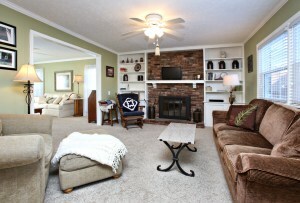 There is a comfortable basement Family Room with gas fireplace that connects to a kitchenette, wine closet, and sitting area as well as a recreation area. The basement level also includes another finished room (currently used as a Bedroom) and a Full Bath. The home has a 2 1/2 car garage, storage room, and five hundred gallon underground propane tank. The back of the home and covered back porch provide stunning views of the property. There is even an invisible fence along the property line to allow pets to run freely. This home has it all! 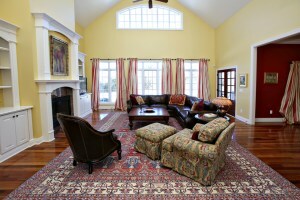 Call today to set up a private showing and view this amazing example of Louisville Real Estate. Happy New Year from At Home In Louisville Real Estate Group! We are starting off the New Year with a bang and looking forward to all of the promise of 2014! Our team enjoyed a wonderful holiday season with friends and family. 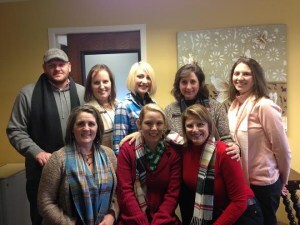 We had a great time gathering together during our team holiday party and are staying warm during this chilly New Year. We wish all of our family, friends, and clients a wonderful 2014 full of peace, hope, love and success. How are you spending your January in Louisville? Have you made any New Year's Resolutions? Some of the most popular New Years Resolutions generally involve health, fitness, family time, financial changes, travel, community involvement, and taking part in recreational activities. Whatever your personal ambition, Louisville is a fantastic place to acheive your goals. Check out a few ideas below to get you started on just a couple of these popular resolutions. Louisville has a multitude of physical fitness opportunites both indoor and outdoor. During the winter months, indoor activites are likely preferable, so we've offered up a few suggestions for fitness memberships. Whether you're interested in a "staycation" or a far of destination, Louisville has some great services to help you with your planning. Louisville is without a doubt a great place to travel into or out of. The UPS hub is located here and according to the company's research 2/3 of US cities are within a 24 hour drive and 3/4 of domestic destinations can be reached in under two hours by air. Below are a few suggests for local and destination travel assistance. Feel free to contact our team for more information about the Louisville area or for up to date information about the Louisville Real Estate market.